I eat yogurt all the time -- it is a really healthy breakfast or snack, it is packed with calcium and good bacteria (which contributes to healthy digestion), and it is very sweet, creamy, and filling. I eat all kinds of yogurts (and sometimes attune probiotic bars with similar benefits), and I have a few favorites including low calorie Fage yogurt which I blogged about previously. Lately I've been eating yogurt many days of the week on top of fruit salad made from bananas, blueberries and frozen cherries. So recently I was perusing the yogurt section of Whole Foods, hoping to mix up my yogurt selection a bit, and an all natural Coconut milk yogurt caught my eye (made by Turtle Mountain). I was intrigued since I absolutely love the taste of coconut, but it is yet another food that that I have found difficult to integrate into my low calorie diet. 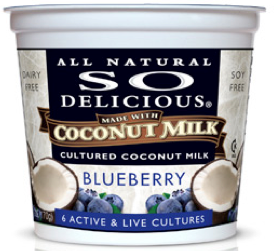 I was also interested in this yogurt since I go through phases where I avoid dairy, and as much as I enjoy soy products, I always think it is interesting to explore non-soy alternatives to dairy as well. And, I'd never seen coconut milk yogurt before! The coconut milk yogurt turned out really good and with its subtle coconut taste, it continues to make a great topper to my frozen fruit. The only drawback is that it is slightly higher in fat than other yogurts, unfortunately making it an extra weight watchers point (3 WW points per cup) over regular yogurt. Regardless, the yogurt ranges from 130-150 calories which is very reasonable for a breakfast or snack. Although I've personally only eaten the blueberry and the strawberry & banana flavors, the coconut milk yogurt also comes in plain, vanilla, raspberry, and mango (which I will try as soon as I find it). Since I'm talking about yogurt, I thought this would be a good opportunity to share a fun little tip I discovered. Sometimes I take the regular yogurts I buy at the store, and I put them in the freezer and let them freeze completely. What results is something in between an icy, ice cream, and frozen yogurt. It is really fun to eat, and the coldness forces you to eat it slowly and enjoy every bite, vs. when it is thawed and creamy. Frozen yogurt cups make a great dessert! Another fun thing to do with yogurt is to eat it with some low calorie cookies, or spread it on some waffles, like Van's Waffles! Speaking of which, I thought it would be fun to ask you if there are any random foods that you freeze that are unexpected like this? this is one of my favorite yogurts! i love the apricot mango one, too. Silk also has some that I can't live without.